The “keepers” of a booming North Yorkshire pub have signed a three-year extension with owners Punch Taverns. 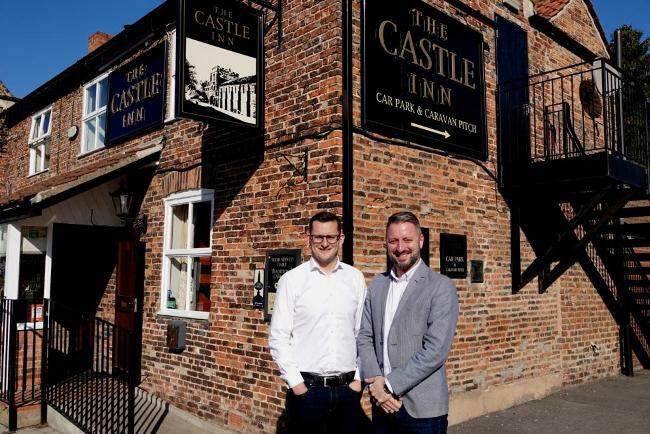 Graham Usher and his partner Matt Rose will continue their journey at the Castle Inn in Cawood, near Selby, after being brought in 18-months ago by the pub chain to help transform its fortunes. The pair, who last month launched MATTGRAY Hospitality Consultants, also run the multi award-winning Drovers Arms, in Skipwith, and have ambitious plans for both hostelries. The Castle Inn pub currently has an 18-pitch caravan site and adjacent shower block, and Graham and Matt are in advanced talks with Punch to develop this into a 14-pod glamping site with enhanced facilities. Graham Usher said: “Having taken over the reins of the Drovers Arms in 2014, and successfully turned it around, Punch Taverns asked if we could take the Castle Inn under our wings. “We knew it was going to be a challenge, but after careful consideration we said yes. In just over a year we have built up a loyal customer base, helped massively by having a great team here. “We have paid particular attention to the pub’s food and beverage operation and we are giving our clients what they want, not what we think they want. Matt Rose said: “We learned lots of lessons when we took over The Drovers, some of which were extremely hard, and these quickly helped to set the Castle Inn on the right footing. “Pubs are vital to the economy of the region and are a focal point of many communities. Cawood is blessed with three pubs, each with a different proposition.